Let's just admit this right now: There are too many podcasts! From true crime exposés, casual chat shows, and even fictional series that harken back to the radio dramas of yore, podcasting rivals television as an overstuffed medium with an overwhelming number of choices. And yet there still are a handful of new and notable shows that we'll always return to, eagerly downloading to binge on our commutes to and from the office in order to experience the larger world beyond our own lives. That's why it's important to share with our friends when we've found a good one worth bingeing. 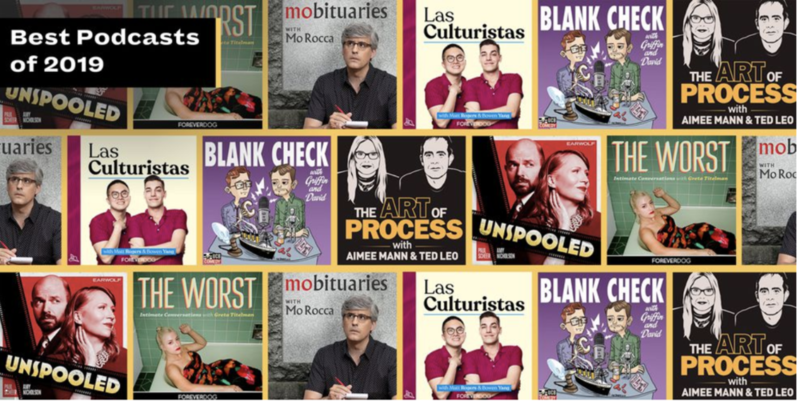 Here are the best podcasts of 2019 so far. As solo artists, Aimee Mann and Ted Leo are accomplished singer-songwriters. Together, the duo has recorded as a band called The Both. And now they have a podcast, in which Mann and Leo invite guests (ranging from comedian Wyatt Cenac to songwriter Dan Wilson) to discuss their own creative processes. The result is an engaging behind-the-scenes look at all of the vulnerabilities that come with being an artist and a reminder that it doesn't happen naturally—it takes hard work. Matt Rogers and Bowen Yang are, at heart, enthusiasts. With Las Culturistas, the pair have turned cultural obsession into an art form and something bigger than simple appreciation. Each week sees a new guest stopping by to chat about current pop culture topics and the formative cultural moments that made them who they are today. Things get personal, things get inspirational, and things can get catty—the seminal episode-closing segment I Don't Think So, Honey sees the hosts and guests ranting about an infuriating topic of their choosing. (The occasional live shows of lightning-round I Don't Think So, Honeys are hilarious and cathartic.) Each episode feels like an invite these two friends have extended to join their inner circle and dish about what's on all of our minds. Elizabeth Holmes is one of the most infamous entrepreneurs to come out of Silicon Valley—nearly as famous as the man she admired, Steve Jobs, although much more notorious. The brilliant wunderkind assembled a multi-million dollar company in Theranos which, along with her radical blood testing invention, was set to disrupt the medical industry forever. That is, if her invention worked. Based on a three-year investigation and using numerous interviews with Theranos staff (as well as legal deposition tapes), The Dropout tracks the dramatic rise and fall of Holmes and her company. Sometimes the most exciting podcast episodes are not borne from the news cycle or some grisly true crime, but from the idiosyncratic obsession of a podcast host's brain. Thank goodness, then, for Mo Rocca. The humorist and CBS Sunday Morningcorrespondent gathers the various facts and trivia inside his own brain for his own personal spin on the obituary. One episode may look at the dearly departed characters who have passed away on popular sitcoms (with the help of TV legends like Henry Winkler and Sandy Duncan); others may look at individual icons like Audrey Hepburn and Sammy Davis Jr. Mobituaries, as a whole, focuses on the people with whom Rocca has always been fascinated—and offers an unconventional examination of their legacies in our greater popular culture. Movie podcasts are a dime a dozen, but what sets Blank Check apart is its hosts Griffin Newman and David Sims' obsession with movies in context—specifically the context of the director at their helm. Following the catalogs of celebrated auteurs (as of this writing, the duo are focusing on Tim Burton), the podcast looks at the individual efforts of major film directors episode by episode, picking apart those filmmakers' strengths (and idiosyncratic weaknesses) that are essential to their larger oeuvre. While the occasional episode breaks free from a director-specific miniseries to focus on a timely new release, the podcast's strengths rely in its hosts tendency to focus on a larger talent in order find appreciation in a director's artistic merits. Comedian Greta Titelman is brash and bold and no-holds-barred. The first time I saw her perform, she yelled about French-tip pedicures in a rant that I think about to this day. ("Your foot should not look like it's about to hand me a menu at Nobu!") With her new podcast, she forces her guests to be just as brave. Subtitled "Intimate Conversations," The Worst sees Titelman asking her weekly guests about some of the most horrific moments in their lives—either actual moments of embarrassment, or simple terrifying fears. The result is a loose and extremely fun interview show that highlights Titelman's curiosity as much as her bite. Actor and comedian Paul Scheer is no stranger to movie podcasts; How Did This Get Made?, the collective effort from Scheer, June Diane Raphael, and Jazon Mantzoukas, devoted hours to mocking some of the worst films of all time. He switches gears on Unspooled, which he co-hosts with critic Amy Nicholson. The duo devote their time to some of the best movies ever made—specifically, the list of the AFI's top 100 films—to deconstruct each of these classics (and, yeah, make a few jokes about them, too).